What are the Last Verified URLs that scroll by in right side panel in Re-Verify Mode? — . :: GSA SEO & Marketing Forum ::. What are the Last Verified URLs that scroll by in right side panel in Re-Verify Mode? Hello. I am finally re-verifying. Well, I've been backlinking into the air it seems. Anyway, as it removes a bunch and the tallies drop in size, why is there a growing list of new URLs in the verified pane at right? Thanks, kindly. make a screenshot please...but you need to wait for an answer as it is almost midnight here and I need some sleep. OK, I know I've taken a lot of your time with questions today. Sleep well, my friend. hmm hard to say without a log....can you just run that one project and check log? I've re-verified everything! Sorry I didn't save the log. 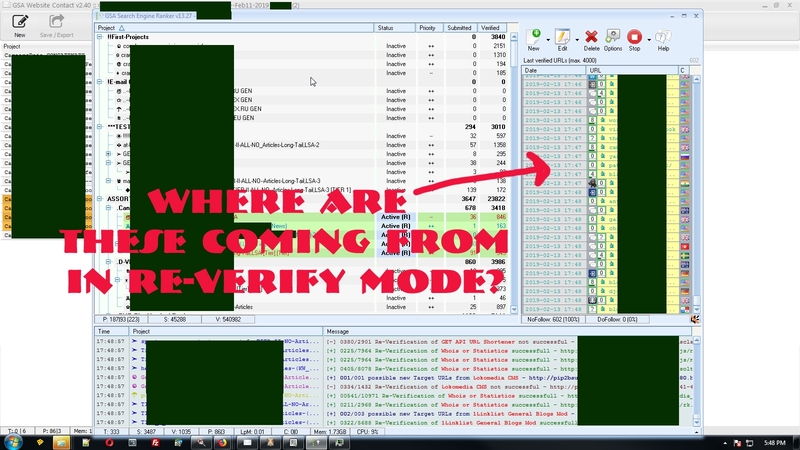 When I need to re-verify next, I'll see what does it. Thanks.